Our flooring was FINALLY installed yesterday after a month of being home from our Christmas vacation. I guess it was worth the wait because are very happy with the new flooring. The company who installed it is located right here in Durham called Carpet One. The owner Greg is a very nice man who will make sure you are well taken care of. And if you feel like you could get a better price somewhere else, they are willing to work with you to match that price. The installers were great and finished up in one day! They did 455 square feet all in the first day. This flooring is by Kronotex and is called the Wilmington Collection Jasper Oak. Now the only thing left is for someone to come out and caulk the nail holes and paint the trim. Then the floors will be officially finished. But we wanted to share some pics with you. I think it's such a wonderful difference and more our style. 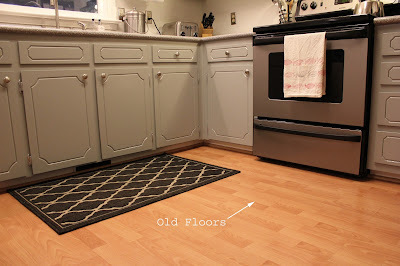 The old floors looked too orangey and cheap. The news ones look textured and rich. And we love the new color. And yesterday ended up being a fun day while we stayed out of the house. We all got to pick up Daddy and have a fun pizza dinner and come home to a finished floor. It was like Christmas morning! I'm really praying the counter tops get here today and the trim is finished up so we can show you some complete After photos of the kitchen. And then next up on our to-do list is install a tile backsplash and lay flooring in the rest of the house.